Polakow rode 43-foot waves (13 meters) after carefully studying and preparing the adventure in the last 12 months. “I’ve surfed all the big waves around the world and I must say that for me, Nazare has been the most difficult and challenging. The waves are coming from many different angles at the same time, making it extremely difficult to judge and be safe,” explained Jason Polakow. 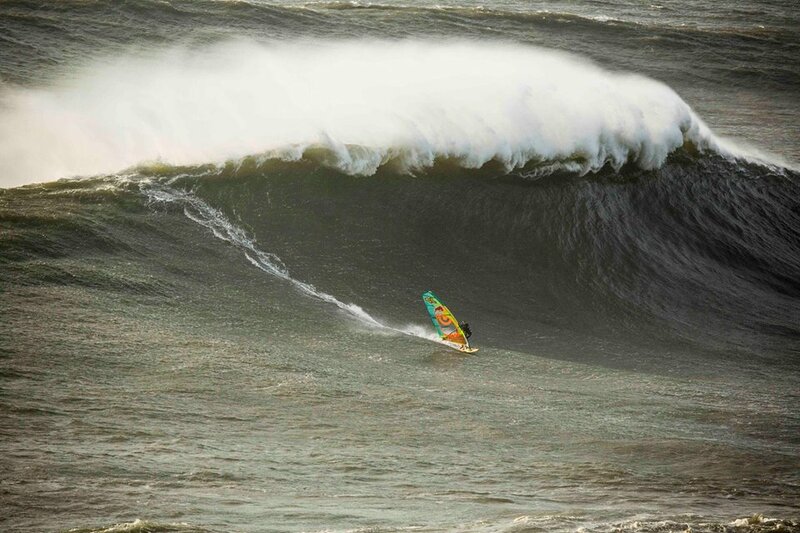 Polakow is arguably the best big wave windsurfer on planet Earth right now. The 44-year-old veteran has already sailed in Teahupoo, Cloudbreak, and he is a well-known face in the Jaws lineup. At Praia do Norte, the conditions were not perfect. JP sailed in light starboard tack winds, and slightly choppy wave faces. Polakow also tasted the power of the Nazare wipeout, and his equipment had a close encounter with the nearby rocks. But that won’t stop him from setting the bar higher. JP wants a record. He wants to beat the 60-foot mark set in Maui. Jason Polakow was born in Torquay, Australia. He is a familiar face on the Windsurfing and World Tour scenes since1990.